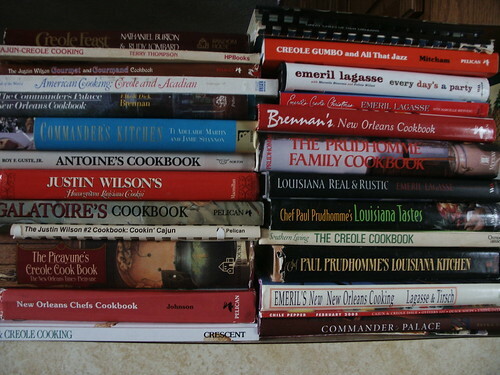 I eventually want to have a fairly complete list of Creole & Cajun Cookbooks and where to find them. The above photo is part of my personal collection. If anyone is searching for a particular recipe from a book I have drop me an email, I will see what I can dig up for you. My Cookbook Page at American Gourmand. A work in progress but a fairly complete list of all of the cookbooks that I admire! – this book is no longer available for free download in Adobe (PDF) format. However, I have a PDF version on my hard drive that I would be happy to share via email! Soul Kitchen by Poppy Z. Brite – Haven’t read it yet as it was just released, but can’t wait. What an amazing site this is! I grew up on the West Bank so I’m very familiar with New Orleans and the culture, as well as the food. You’re doing a remarkable job documenting a truly unique and outstanding cuisine and I hope you continue this project indefinitely. As for the cookbooks, two that I didn’t see on your list that you may find of interest are “La Bouche Creole II” and “The Frank Davis Seafood Notebook”. I like both of the Soniat books for the recipes but also for the background information on the culture of the area. I believe that “Creole II” was completed by Leon Soniat’s wife after his death. The Frank Davis book is also very interesting – a lot of good tips on seafood and is more of a “working man’s” cookbook – not fancy but some good dishes. Danno, All I can tell you is “Thanks”. I was born and raised in Louisiana. My in laws live in Metarie now and we just got back from a family reunion. Their home was damaged in H.K. and it was nice to get back to the crawfish boils, fresh fried catfish, and the gumbo. I am going to use your File’ gumbo recipe tomorrow. I can’t wait! Anyway, your collection of recipes really hit home for me and my husband. I love this site and will continue to visit it constantly. Do you know about Kitchen Witch Cookbook store in the French Quarter? They have over 5,000 titles and an extensive Creole Cajun section. They are at 631 Toulose St. They ship very inexpensively and take special orders graciously. I found my “storm replacement” copies there. New Orleans Cuisine, also through Louisiana University Press. She also wrote many cooking columns for magazines like Southern Outdoor Living and others which escape me at the moment. If you can find any of them I think you would find them of value for your collection. The best New Orleans cookbook, by far, is The New Orleans Cookbook by Richard and Rima Collin. I’ve used mine so much that I may need a rubber band together. And i can’t replace it as the hard-bound edition, like mine is out of print. BOO! This is a great list and a fantastic website. I have just moved to the New Orleans area and would like to know which is the one book for Creole and the one book for Cajun cooking that I should have in my collection. Your suggestion shall be greatly appreciated. Curious Onlooker…that is a tough call. I’m working on a recipe for Daube Creole to make tomorrow and had no less than ten books open tonight! Let me streamline and I will give you a top 3 on both sides in the next few days. On the Creole side though, Creole Feast is in my top 3. More to come!